I’ve been using this method for cross browser inline-block displays for a while and thought everyone else knew about it too. One of my co-workers was shocked to find out they had been doing it wrong for so long. So I thought I would share it in case someone else didn’t know about it. Older versions of Firefox support inline-block with a special “-moz” tag. But not the one you think. It uses ‘-moz-inline-stack’ instead of ‘-moz-inline-block’. And when I say older versions I mean anything before version 4 I believe. So really, you don’t have to add it if you don’t want to. I don’t. But if you keep it, make sure ‘display:-moz-inline-stack’ comes BEFORE ‘display:inline-block’ so newer versions of Firefox can use the standard style. IE supports inline-block, but only for elements that are natively inline, such as span and strong. When ‘zoom: 1′ is set, it triggers hasLayout and magically IE supports inline-block. The *property is an IE hack that does not get run for non-IE browsers. 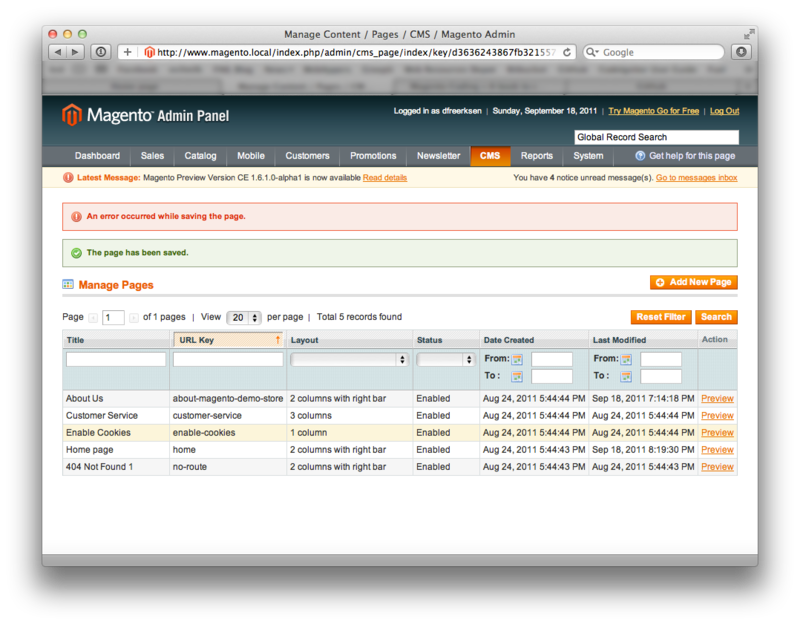 One of the things Magento got right is blocks. It’s one of the few things I am continually impressed by. There are a lot of ways to add a static block to the page. Adding a static clock through layout XML can be very useful if you need to add a static block to a sidebar on a single page for example instead of all pages. Adding a static block through a short code is very powerful. It allows you to add a static block into a CMS page or even your products. Before the uprising in Libya, even though it is part of the Marine Corps Hymn, I really doubt most Marines knew were Tripoli was located. ‘To the shores of Tripoli’ in the Marine Corps Hymn stems from the Battle of Derne. It is the first recorded land battle fought overseas by the United States. It was after this battle that 1st Lt. O’Bannon was presented the Mameluke sword, which is still worn by Marine officers today. More Marines are aware that ‘The Halls of Montezuma’ is from the Battle of Chapultepec, only because it is from this battle that we get the blood stripe that NCOs wear to commemorate the Marines that died during this battle. I doubt most Marines know that the Battle of Chapultepec was fought during the Mexican-American War were US forces fought Mexican forces holding Chapultepec Castle located west of Mexico City. Please stay tuned to the blog, on our next post I will be reviewing baby strollers to know all about strollers. What is a virtual host? Virtual hosting is a method for hosting multiple domain names on a computer using a single IP address. There are boat domains for sale at dominion.domains in case you want to stand out in a crowded sea of .coms. Shared hosting uses this same method for all of the sites they host. Aren’t those URLs you use in Zend Server getting pretty ugly? Would you like to change http://localhost/my/awesome/website into http://www.super-awesome.local You can! Last time we talked about general Zend Server setup. This time, we will be going through setting up virtual hosts on your tweakyourbiz local machine. This again will involve Terminal. This assumes you have Zend Server set up and running. If it is not, go here.